So as of last night I have finished laying out the Addington North mosaics in Gimp. Today's job is to mask off the relevant bits of the retro images, and then render the part and full images for Qgis. Whilst I have enough now to start mapping Addington, I have determined to do only two tasks simultaneously, one of which is for the Otago Central Maps and one is for the MNL maps, so I will not start mapping Addington until I have finished laying out all the maps, and at this stage there is still East to be done as this area includes the actual MNL junction. To do this post I have had to render one additional area of West which doesn't contain any railway sidings, so as to display a full view of the area. West side of Addington, present day. 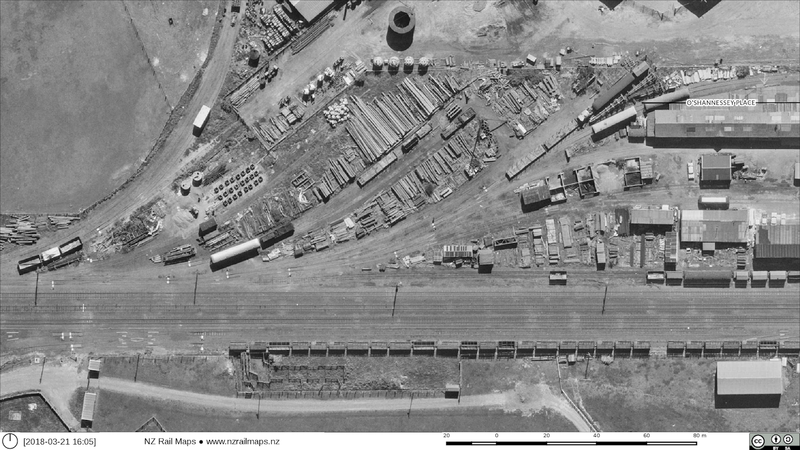 West side, full 1970 aerials, with modern street layout for reference. A breakdown of this map into four areas is below. 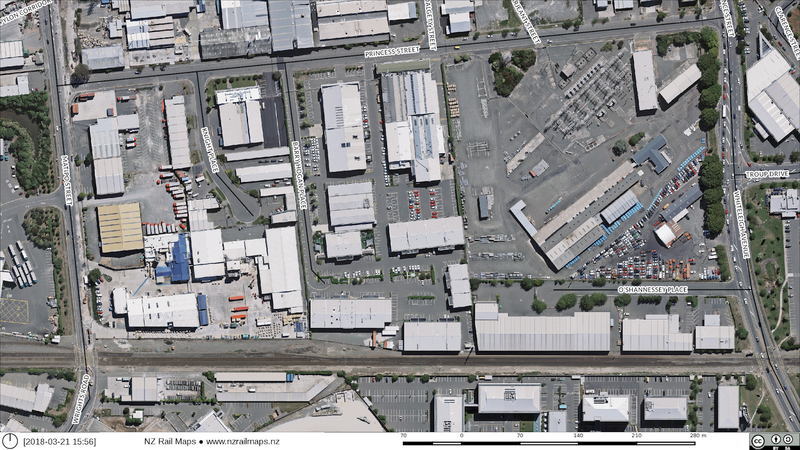 At the Matipo St end of Addington, the designated purpose of these sidings is presently unknown. 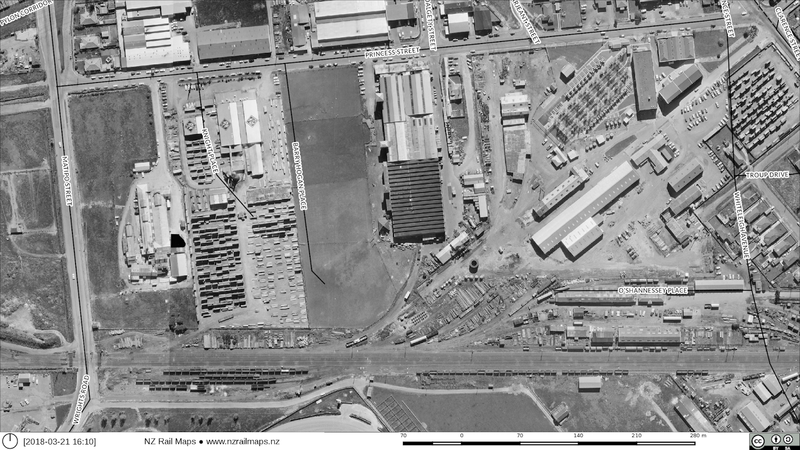 They are immediately adjacent to Addington Raceway, and by 1970 were full of withdrawn stock wagons. 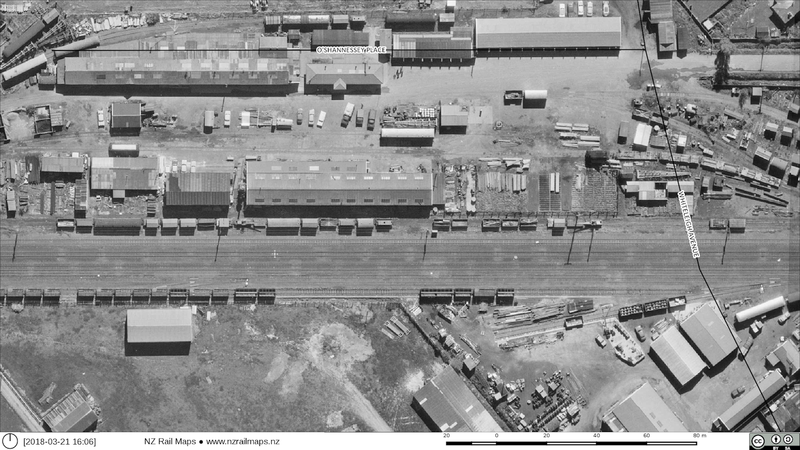 At the north side of the main line, we can see a siding going into premises at the rear of the P&N (Patience & Nicholson) factory. North of the mains and east of Barry Hogan Place we have these as yet unidentified premises in Princess Street with a rail siding. A stub of this siding still exists on the railways side of the fence. 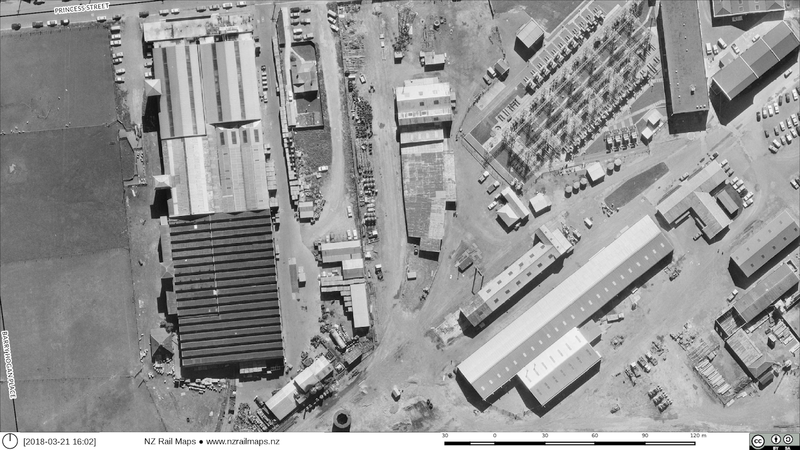 The rearmost building with a sawtooth roof has been demolished but the gable roofed buildings north of it still exist and today are used for warehousing. The street frontage is occupied by the modern premises of the Ministry of Education. On the east is the Princess Street electricity substation, which still exists today but doesn't have any rail sidings into it. 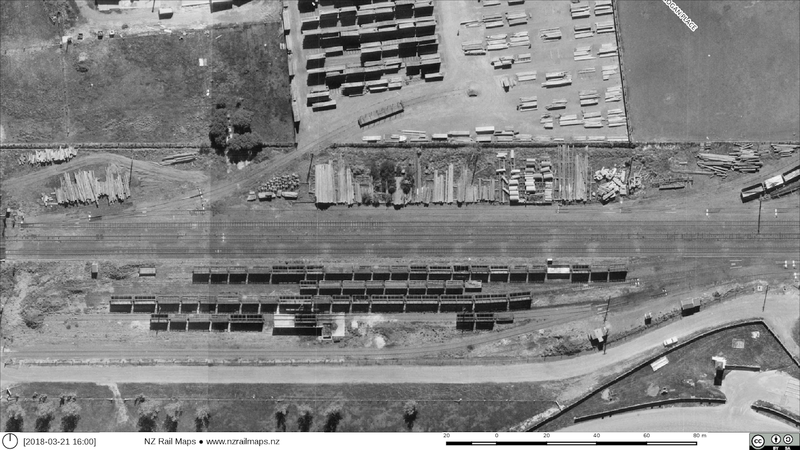 Immediately to the south side of the previous photo here is a view of, upper right, Addington Plant Zone at its western end, where the Way and Works Department of the Railways stored their plant and equipment. South of the tracks appears to be the siding that was used to load and unload horses for Addington Raceway. Which at the time of this picture is full of disused stock wagons. The last photo of this western segment of Addington shows the bulk of the Plant Zone area to the north of the mainline corridor. All of this area today is office blocks and industrial premises. Whiteleigh Avenue was pushed through this area in the late 1980s following the closing and demolition of the Plant Zone site. At the south side we can see the raceway siding alongside a platform which may have been used for passenger trains at some stage, this platform still existed for many years afterwards. 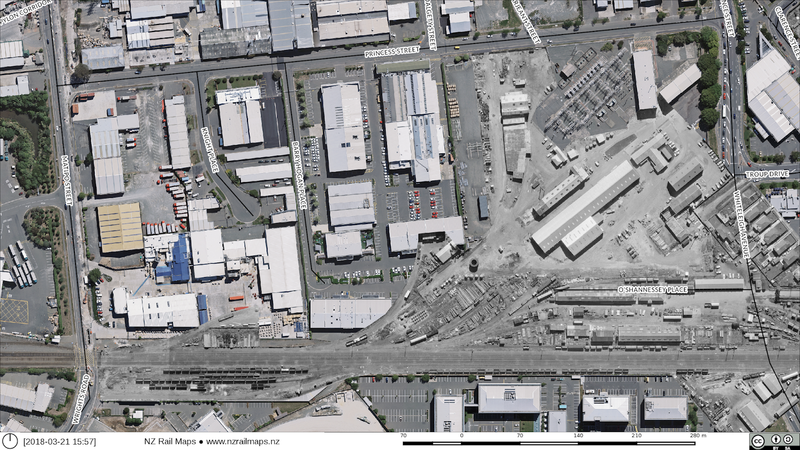 At lower right is the railway Signals depot which again was a casualty of the Whiteleight Avenue road extension.